The Special Light-Sport Aircraft version of Quicksilver Aeronautics' popular Sport 2 model is completing efforts to gain FAA acceptance. An FAA audit is scheduled in December and the company announced it has completed the entire flight test regimen required to comply with ASTM industry consensus standards. A recent update to the standard now demands that a company must accumulate 100 hours of flight testing. Homebuilders expend some time to log the 40 hours required for an Experimental Amateur Built kit; this is two and half times as much. "We completed an entire ASTM Design & Performance standard test matrix," said Daniel Perez, Chief Operations Officer for the California company. He also noted that those 100 flight hours involved 236 takeoffs and landings. These results follow a long period of other detailed testing and significant document preparation plus establishing the factory for repeatable, quality-controlled production of ready-to-fly aircraft. Quiclsilver's Sport 2S is a strutted, wide open cockpit, side-by-side two seater and will be the first Quicksilver aircraft to complete the entire compliance package. 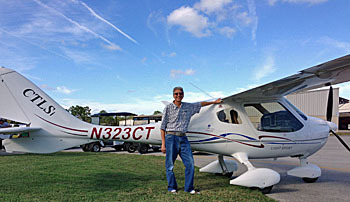 However, exactly 20 years ago, Quicksilver certified their tandem two seat GT 500 aircraft under FAA's Primary Category. The '500 was the very first aircraft to achieve Primary Category approval in 1993. "[For the Sport 2S] we also had to demonstrate dive speed condition, which calls for flight greater than Never Exceed speed for the Sport 2S model," observed Perez. Takeoffs and landings were demonstrated in cross winds beyond 15 knots. In addition, stability and control were demonstrated without problems over the full Center of Gravity range." To achieve this, he noted that more than 50 stalls and 20 spins were performed with no abnormal characteristics. Longtime Quicksilver sales manager Todd Ellefson raced to add, "We caution our thousands of aircraft owners that these are functions performed in a test environment and such excess speeds and maneuvers are expressly prohibited in normal operation of the aircraft." Todd is a highly experienced Quicksilver pilot who flew the 100 hours of testing in the 2S. In meeting ASTM standards, Quicksilver was aided by consultants from Streamline Design, one of the industry's professional engineering firms specializing in Light-Sport Aircraft and ASTM. Streamline's Severin Kempf observed, "The pilot and platform handled well throughout the testing. We put the airplane through some hard maneuvers and some really hard landings. Everything went as planned. It was particularly interesting to watch this aircraft in a spin." Severin worked on the extensive flight test program with Quicksilver's Ellefson and added that Todd "was really good to work with on the flight testing." "Our success in achieving these solid results prepare us for a visit from several FAA officials scheduled for later this month (December 2013)," said Quicksilver Aeronautics President, Will Escutia. "If we gain the approval of the agency we are prepared to swiftly put the Sport 2S into production as a fully-built aircraft." Quicksilver is now preparing for FAA's audit visit (usually a team of 3-6 persons for three or more days). Assuming all goes well, the company will be head down working at entering the Sport 2S into production. For this reason they'll be passing the Sebring LSA Expo this year but plan a public release of the highly anticipated SLSA at Sun 'n Fun 2014. The event runs April 1-6 next year. Update 12/18/13 — Watch our video with Quicksilver's Daniel Perez to hear more about the work his company has put into meeting ASTM standards even on a well-proven design. The Special Light-Sport Aircraft version of Quicksilver Aeronautics‘ popular Sport 2 model is completing efforts to gain FAA acceptance. An FAA audit is scheduled in December and the company announced it has completed the entire flight test regimen required to comply with ASTM industry consensus standards. A recent update to the standard now demands that a company must accumulate 100 hours of flight testing. Homebuilders expend some time to log the 40 hours required for an Experimental Amateur Built kit; this is two and half times as much. “We completed an entire ASTM Design & Performance standard test matrix,” said Daniel Perez, Chief Operations Officer for the California company. He also noted that those 100 flight hours involved 236 takeoffs and landings. These results follow a long period of other detailed testing and significant document preparation plus establishing the factory for repeatable, quality-controlled production of ready-to-fly aircraft. Quiclsilver’s Sport 2S is a strutted, wide open cockpit, side-by-side two seater and will be the first Quicksilver aircraft to complete the entire compliance package. My friend John Lehotsky enjoyed a flight in a superbly equipped CTLSi with a full digital panel. Quicksilver's Sport 2S is an easy-to-fly, easy-to-afford aircraft enjoyed by many airline pilots. Airline pilot Jon Thornburg provides primary flight instruction in a GT 500 much like this one. I recently flew with a friend who has some interest in learning to fly. After we got out of a Flight Design CTLSi equipped with dual Dynon 10-inch SkyView screens flanking a Garmin 796 — in all, an awesome amount of beautifully presented information — my friend sighed and made a statement that he could probably never do what I'd just done. We'd gone aloft and I pointed out to him the marvels of synthetic vision, ADS-B traffic and weather, direct-to navigation that would take us straight home and so much more. No wonder he felt completely overwhelmed. I didn't see it as overwhelming, of course. I delighted in all that easily accessed info and loved showing my friend just a few of the features available. However, on later reflection, I remembered the serious study that even an experienced pilot like myself had put into learning those magnificent digital instruments. Would my friend have been better served by experiencing aviation and the magical view from aloft had we flown, for example, an unassuming Quicksilver 2S? Would flying a "mere ultralight" have made flying seem more achievable and accessible? My friend has flown with an instructor in a hang glider so he would not be put off by the huge openness of the Quicksilver. He certainly would not have been intimidated by highly sophisticated instrumentation (it needs hardly any beyond a couple engine gauges). The landscape would have drifted underneath at what I call "human speed," a more leisurely pace that anyone can absorb. Cruising at 50 mph covers ground in a way that lets you take in the majesty of your surroundings in this lovely country of ours. I think it much more likely he would have thought, "Hey, I can do this!" He could also afford it much more comfortably than a $150,000 LSA that has every bell and whistle installed. A new Quicksilver can be created for $30,000. Recently, some communication brought another interesting perspective. The following words were written by a west coast friend, Jon Thornburgh ... a former military flight jock and Delta Air Lines pilot who has every rating in the books plus the credential to teach in pretty much anything that flies. Jon writes concisely and precisely, I think, and I believe you should read his view, remembering that he's flown the "big iron." 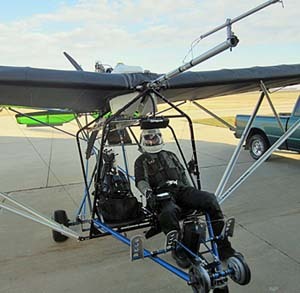 Jon operates a Quicksilver GT500 "ultralight" and provides primary flight instruction in it. 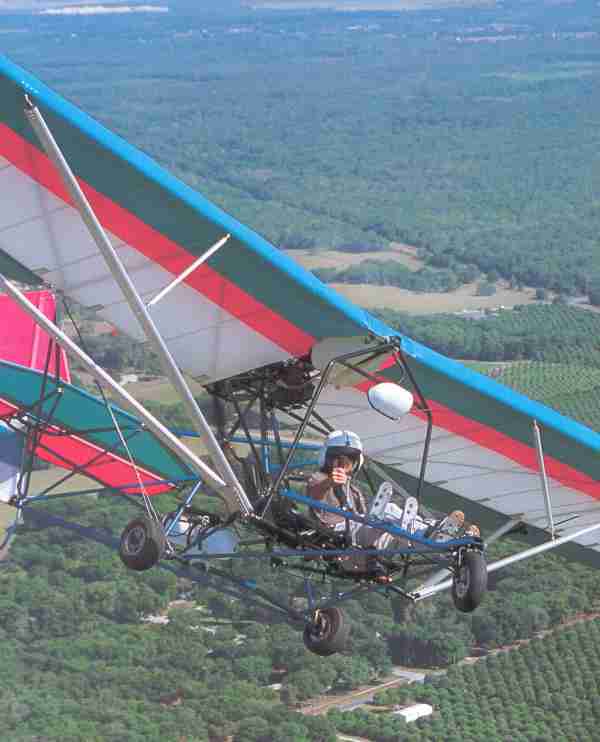 Jon wrote, "Even with my aviation experience, I learned a lot about flying when I got into ultralight flying. • I learned that an airplane will fly even if you don't have a single instrument on it. Wow! You can even fly without an airspeed indicator and altimeter. That would be heresy for a Cessna pilot to even consider. • I learned you can land on a farmer's field that doesn't have a two thousand foot paved strip complete with runway markings, windsock, and air traffic controller giving instructions. • I learned that you can bring your own tools when you fly and do some maintenance that will get you back home. • I learned that you can fly within FAA rules that contain only two pages (FAR 103) and not the 150 pages that a private pilot has to learn. Amazing enough, you can even fly safely without taking an FAA 'Knowledge Test.' "I learned that someone can learn to fly without an FAA flight test, without a specific number of flight training hours, without training 'under the hood' for instrument flying, and without flying at night. • I learned that you can land within 25 feet of a designated spot when the engine is at idle (for practice) or when the engine quits for real. I learned that you can do a 180-degree turn and land downwind back on the runway should the engine quit at 400 feet after takeoff. • I learned that an ultralight pilot can teach another person how to fly without a commercial-instrument-CFI rating. • Most importantly of all, I re-learned that flying is fun and not a task, with no firm requirement to fly + or - 10 knots, + or - 5 degrees, and + or - 100 feet throughout your flight, like you have to do on an FAA flight test. "So," Jon concluded, "ultralighting is not the bottom of aviation. In my opinion, it's the top and the best." Thanks, Jon! 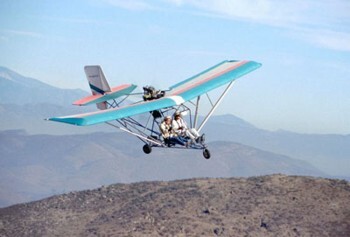 I've got to get my friend John up in an "ultralight" real soon. I'm betting the smile he had after the CTLSi flight can broaden even further. I recently flew with a friend who has some interest in learning to fly. After we got out of a Flight Design CTLSi equipped with dual Dynon 10-inch SkyView screens flanking a Garmin 796 — in all, an awesome amount of beautifully presented information — my friend sighed and made a statement that he could probably never do what I’d just done. We’d gone aloft and I pointed out to him the marvels of synthetic vision, ADS-B traffic and weather, direct-to navigation that would take us straight home and so much more. No wonder he felt completely overwhelmed. I didn’t see it as overwhelming, of course. I delighted in all that easily accessed info and loved showing my friend just a few of the features available. However, on later reflection, I remembered the serious study that even an experienced pilot like myself had put into learning those magnificent digital instruments. Last Spring I had the pleasure of photographing the several aircraft that make up the stable of the re-emergent Quicksilver Aeronautics company. Quicksilver is the once-and-future, Cessna-style flagship of the ultralight industry back in the 70s and 80s, when it sold almost 15,000 single seater and two-seat aircraft kits under the FAA Part 103 regulation. What always blew me away about Quicks, beyond their easy-to-fly, docile performance and truly bugs-in-teeth fun personality was the impeccability of the kits themselves. I haven’t seen one in years, but according to people I’ve talked to, they’re even better than they were back then…and that’s saying something! Quicksilver kits were the epitome of how a kit should be produced for sale. If you ever put together a Revell plastic model then you’ve got some idea of how a Quick kit arrives. All the anodized aluminum structural tubes for example are predrilled, immaculately finished and vacuum shrink-wrapped onto large printed cardboard sheets that individually identify every piece right where it’s “mounted” onto the sheet. Inventory is a breeze, and assembly doubly so, since you don’t cut open any clear blister pack of parts until you actually need them. Believe me, having built my share of hang gliders and ultralights in those days , including several Quicksilvers for a company I worked for, being able to keep track of hundreds or thousands of parts that can easily disappear in the shop is a real boon. Quicksilver kits also really are, by and large, giant Erector Sets. If you’re even halfway decent following instructions, and Quick instruction manuals are wonderfully thorough, you can breeze through the assembly in a matter of a few days, rather than the weeks or months or even years more typical of EABs. You couldn’t be blamed, therefore, for thinking, with this high degree of prefabrication, that Quicksilver kits would stumble on the 51% requirement of the FAA Experimental Amateur Built (EAB) category. Yet just today Quicksilver Aircraft announced five of its kits have just passed the FAA’s EAB criteria. Congrats are due. Joining the ranks EAB aircraft are the Quicksilver MX Sport, MX II Sport, MX Sprint, MX II Sprint, and the Sport 2S. Two models are single seaters and three are side-by-side two-seaters. Check the choices at the FAA list of all Amateur-Built Aircraft kits. In a release, Will Escutia, president of Quicksilver Aircraft, said “FAA’s visit proved the company under new leadership is maintaining the high standards for which Quicksilver has been known.” Ops Chief Dan Perez went on to talk about the two LSA-style models, the GT 400 enclosed single-seater and the GT 500 enclosed tandem two-seater. “Both GT series models have already been approved and, with the MX series, all appear on the FAA’s approved kit list.” That brings the Quicksilver fleet to seven EAB models. Quicksilver, which had quietly soldiered on in the ’90s and 2000′s until Mssrs. Escutia and Perez bought the company, received a fresh infusion of greenbacks and is more aggressively marketing it’s time-proven products. Production will continue in Temecula, California, the long time home of the company. For our corner of the aviation galaxy, the GT 500 will be offered as an SLSA in the future. The company is currently going through the ASTM certification process. 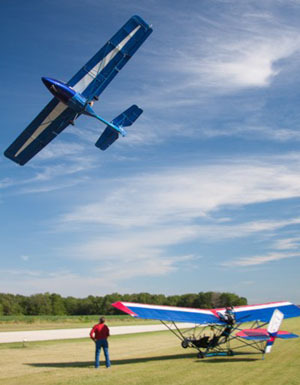 Some of you may remember that sunny day at Oshkosh (1993) when EAA’s then-President Tom Poberezny and Lyle Byrum, flamboyant former head of Quicksilver, jointly announced the first-ever aircraft approved by FAA to live under the Primary Aircraft category, which can be seen a kind of precursor to the Light Sport Rule. There are many Quicksilver dealers throughout the country and around the world. Thousands of fun-flying Quicks are flying in nearly 100 countries, with an enviable safety record. Pricing isn’t posted online: Contact your local dealer. Last Spring I had the pleasure of photographing the several aircraft that make up the stable of the re-emergent Quicksilver Aeronautics company. Quicksilver is the once-and-future, Cessna-style flagship of the ultralight industry back in the 70s and 80s, when it sold almost 15,000 single seater and two-seat aircraft kits under the FAA Part 103 regulation. What always blew me away about Quicks, beyond their easy-to-fly, docile performance and truly bugs-in-teeth fun personality was the impeccability of the kits themselves. I haven’t seen one in years, but according to people I’ve talked to, they’re even better than they were back then…and that’s saying something! Quicksilver kits were the epitome of how a kit should be produced for sale. If you ever put together a Revell plastic model then you’ve got some idea of how a Quick kit arrives. All the anodized aluminum structural tubes for example are predrilled, immaculately finished and vacuum shrink-wrapped onto large printed cardboard sheets that individually identify every piece right where it’s “mounted” onto the sheet. ELSA Trainer Owners – 1/31 Deadline! January 31st (about 3 weeks away) is an important date for anybody who owns an E-LSA aircraft that’s used for training, whether or not they actually use it for training operations. *** If owners don’t apply for the amended certificate by the 1/31/2010 deadline, their current airworthiness certificate will expire, and another will not be issued! *** Kinda serious stuff. *** Not sure your ELSA falls under this category? Check your airworthiness certificate. On the right side under the serial number and model is the word “expiry.” If the box has “unlimited” in it, you’re golden. But if it has the date “January 31, 2010”, it was originally given the operating limitations for flight training, and you must renew it! *** The fedgov rationale in play here: you cannot amend a certificate if it’s expired. After Jan. 31, you’re toast. *** Quick background: Apparently the ruleworks involved in permitting flight training in ELSA to continue in general is bogged down at FAA. Don't wait until the last minute to request your records from USUA, ASC, or EAA. The number of requests is bound to accelerate as the deadline bears down on ultralight pilots. So, you're an ultralight pilot with many hours flying one of the great light airplanes that enjoyed the limelight long before Light-Sport Aircraft. Then FAA goes and creates a new class of pilot. Now, despite your pilot credential from USUA, ASC, or EAA, you have to go get a new one. Earning it involves a written test plus a flight check with oral exam...all of which you've already taken. "What sense does that make," you ask? Point taken, but that flight has left the ground. You have to do it and you ought to do it soon. Why? Because if you act before January 31, 2007, you can at least get credit for all that time you've logged. What's worse than having to pay to take tests for stuff you already know? How about having to go fly with an instructor to acquire the 20 hours it takes to qualify for a Sport Pilot certificate? (It isn't called a "license.") So, don't wait. Click links under the photo. *** Of course, I hasten to add that Part 103 is not changing! 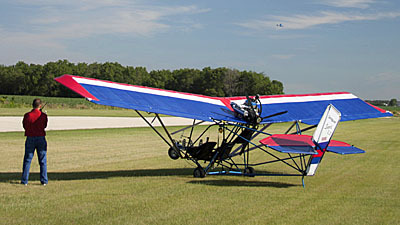 Ultralights continue in their original definition. So, you’re an ultralight pilot with many hours flying one of the great light airplanes that enjoyed the limelight long before Light-Sport Aircraft. Then FAA goes and creates a new class of pilot. Now, despite your pilot credential from USUA, ASC, or EAA, you have to go get a new one. Earning it involves a written test plus a flight check with oral exam…all of which you’ve already taken. “What sense does that make,” you ask? Point taken, but that flight has left the ground. You have to do it and you ought to do it soon. Why? Because if you act before January 31, 2007, you can at least get credit for all that time you’ve logged. What’s worse than having to pay to take tests for stuff you already know? How about having to go fly with an instructor to acquire the 20 hours it takes to qualify for a Sport Pilot certificate? The Quicksilver Sport IIS has been transformed from a cable braced ultralight to a strut braced model. Although this simple flying machine is one of the most successful aircraft ever built, the California company managed to make the new model even more appealing as it heads into a third decade of production. The most noticeable change to the new ultralight are the wing struts that completely replace the wing's upper surface cable rigging. Now the upper surface is free of obstructions to a smooth airflow and has a cleaner appearance. Other changes are more subtle but even with extensive tubular reinforcement the IIS weighs 430 pounds empty, well under the exemption weight limit. With its large 170 square foot wing the newest Quicksilver feels like the ultralight the public expects. 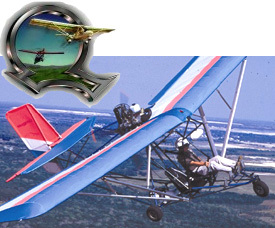 This image and its comfortable flying charactertistics jointly account for it being the most popular training ultralight in the world. Experienced pilots from all segments of aviation in many countries have come to love the Quicksilver. Now they can purchase one with further refinement which maintains the company's reputation for thorough engineering and quality manufacturing. The single surface Sprint line and double surfaced Sport models are each available in one and two place versions. In addition to being particularly well proven Quicksilver Manufacturing offers the industry's most extensive support network, with many dealers stocking parts and having broad knowledge needed to support owners. From my perspective you you just can't go wrong with the Quicksilver. The Quicksilver Sport IIS has been transformed from a cable braced ultralight to a strut braced model. Although this simple flying machine is one of the most successful aircraft ever built, the California company managed to make the new model even more appealing as it heads into a third decade of production. The most noticeable change to the new ultralight are the wing struts that completely replace the wing’s upper surface cable rigging. Now the upper surface is free of obstructions to a smooth airflow and has a cleaner appearance. Other changes are more subtle but even with extensive tubular reinforcement the IIS weighs 430 pounds empty, well under the exemption weight limit. With its large 170 square foot wing the newest Quicksilver feels like the ultralight the public expects. This image and its comfortable flying charactertistics jointly account for it being the most popular training ultralight in the world. Experienced pilots from all segments of aviation in many countries have come to love the Quicksilver. NO HIGH WIRES - The upper surface of a Quicksilver has never been cleaner. Now with streamlined struts, Quicksilvers take on a new look. STRONG STRUTS - Though cable-bracing is hard to beat for strength and low drag, many pilots want strutted looks, so Quicksilver is answering those requests. TUBULAR TAIL - Long ago, Quicksilvers used cable- bracing for much of the tail's support, but this is now all-tubular reinforcement. GAS PORT - Tucked down under the new gap cover is the fuel tank filler cap. The upper surface is much cleaner than with kingpost-and-wire bracing. WHOLE NEW WING - As the light shines through the wing, you can see internal bracing members which replace old crossed brace cables. The wing is essentially the FAA-certified GT 500 wing in rectangular form. FOR SURE - Pilots will have little doubt about the security of this strut fixture with no less than five aircraft-grade bolts doing duty. HAND HOLDING - Since your hands are nearly touching, on the shared center joystick, instructors get an extra "feel" for their student's understanding of the joystick wiggling part of flight instruction. SWITCHERY - Overhead, in an out-of-the-way spot, is the kill switch as well as electric starter. An intercom is strapped onto the front of the battery box and a ballistic parachute handle resides nearby. SAFETY FIRST - Despite its excellent reputation as a safe vehicle, a great many Quicksilvers have ballistic parachutes fitted. This Sport IIS also had the 4-point seat belts that are recommended with such emergency systems. SIMPLER NOSEWHEEL - The nosewheel support and linkage system is simpler than older Quick models, thanks to the new lower cage construction. Think about the Cessna 172, workhorse of general aviation and the most popular aircraft ever built. Cessna is once again building them though the plane has seen little change other than new interior finishings and avionics. Standard Features Rotax 582 engine, ASI, full dual controls with dual rudder pedals and steerable nosewheel, dual throttles, mechanical brakes, in-flight adjustable trim, 4-point seat belts, double-surface presewn wings, 2-blade wood prop, extensive manuals. Options Warp Drive composite prop, ballistic parachute, floats, instruments, electric starting. Pros - America's most commonly used trainer is now available with struts, lending a modern look (though cable-bracing is still available on other MX-series models). Quicksilver has one of the best quality control systems in the business and has substantial in-house machining ability via related businesses. Dealer support is good throughout the world. Certified in some countries and as well-tested as any design flying. Cons - Struts are heavier than cable-bracing (though 2-seater can still qualify under ultralight training exemption easily). Open cockpit won't fit some locales and fairing this design actually detracts from some of its appeal. Even with struts, some buyers will view the design as dated. Pros - Design is elegant in its simplicity with few systems to manage. Trim lever moves stick and is precise and reasonably effective. Easy repair access. Brake lever is on front of stick where each occupant can use it. Test ultralight was equipped with electric starting. All aspects of the ultralight are available for easy inspection and repairs. Switches located overhead in secure, out-of-the-way location. Cons - Those who want flaps, radios, and navigation equipment have other ultralight choices that may be more appropriate. Trim system could use additional range when flown solo; lacked enough nose-down range (though an adjustment may fix this). Brake lever requires a large hand for maximum effectiveness. Pros - Wide open cockpit allows intimate air contact and huge visibility. Fun, friendly flying (if the weather is pleasant). Entry/exit are effortless. Dual pedals and center stick with extra long grip area for student and instructor. Side-by-side seating is often considered optimal for training. Test ultralight was equipped with 4-point belts. Cons - Its strength is also its weakness; many buyers don't seek open-cockpit designs, which are windy. Sits on its tail till occupied. A pod must be bolted on if you want instruments that aren't clamped to tubes. Control stick and throttle have no hand support. Nosewheel can throw loose materials toward pilot. Seats have no adjustment. Overhead instrument pod requires considerable eye movement. No cargo area. Pros - Standard nosewheel steering is effective and operable from either seat. Brakes worked well. Taxi visibility is open in all directions. Absorption surprisingly good considering suspension is limited to air in the tires and frame flex; new lower frame is built of larger diameter tubing. Very stable in taxi, thanks to broad gear stance. Cons - The IIS rides low over the ground; tall weeds can catch on frame members. Lack of true suspension can mean damaged parts when landings are too hard (though parts are replaced with surprising ease). Students must be instructed not to put their feet on ground while moving. Brake effectiveness is weak (common on many ultralights). Pros - The IIS rides low over the ground; tall weeds can catch on frame members. Lack of true suspension can mean damaged parts when landings are too hard (though parts are replaced with surprising ease). Students must be instructed not to put their feet on ground while moving. Brake effectiveness is weak (common on many ultralights). Cons - You can get too slow on landings, running out of flare power if you approach very slowly (thought this IIS model seemed somewhat better at energy retention). Lack of suspension may increase parts damage on poor landings. No flaps and limited slip potential for approach control. Minimal sufficient ground clearance for off-field landings in rougher terrain. Pros - Very predictable handling. Pitch is actually quite light. Full-span ailerons work well without excessive adverse yaw. Rudder is as powerful as ever. Trim is quite effective, especially when dual. Precision turns to headings are straightforward. Roll rate is fast enough but won't surprise new pilots. Cons - Pitch is light enough that you can over-control. Rudder remains a strong force but no longer dominates handling (though this may be appreciated by some 3-axis pilots). Stick pressure is heavier in roll than pitch, causing some reduction in harmony; my Dutch rolls were not precise at first. Pros - Climb is very strong with 65-hp Rotax 582, factory states 850 fpm (and Quicksilver is careful about specifications accuracy). Cruise speed seemed higher than older, cable-braced models, though this is quite subjective. 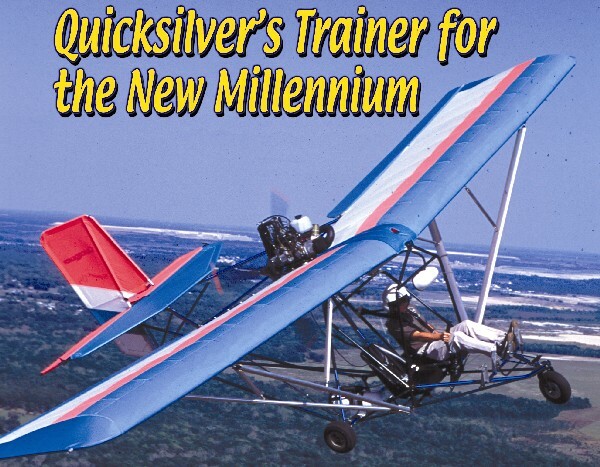 Quicksilver IIS remains very tolerant of flying techniques, part of what makes it a good trainer and starter ultralight. The ability to handle short, soft fields with ease can be considered a performance attribute. Cons - Glide is weaker than many cleaner, faster designs. Sink rate is on the high side of average for a 2-seater. Fuel burn is high. It's hard to fault a design this popular; clearly it does what most buyers want. Pros - Stall recovery is nearly immediate, minimizing altitude loss. Speeds were very slow in every test. Good spiral dampening. Push/pull-release stability test produced excellent results. Design is very tough in the air; I doubt it could be broken even with very poor technique. Factory often fits ballistic parachutes even though design standards are rigorous. Adverse yaw surprisingly low for full-span ailerons. Cons - The Quicksilver design is one of the most reliable, making faultfinding challenging. I looked for weaknesses and found none in this category. Pros - Very good value for an ultralight that will give loads of satisfaction. Superb choice for instructors, a common trainer in the U.S. and in many countries. Students will accept it as a "genuine ultralight" immediately. Structure is arguably the most proven ultralight in existence. Quicksilver offers superior support; many dealers stock parts and offer full services in nations around the world. Company's assembly, flight, and maintenance manuals are among the best available. Cons - Design appears dated to some buyers, even with the strut fittings and cleaner upper surface. Flies too slowly for hard-core cross-country pilots (as do many ultralights). Not enough features for some buyers. Glide and sink rate performance are modest. Weather exposure is too great for some climates. Think about the Cessna 172, workhorse of general aviation and the most popular aircraft ever built. Cessna is once again building them though the plane has seen little change other than new interior finishings and avionics. Published in Light Sport and Ultralight Flying Empty weight 430 pounds Gross weight 1,000 pounds Wingspan 31 feet 2 inches Wing area 170 square feet Wing loading 6.1 pounds per square foot Length 18 feet Height 8 feet Kit type Assembly-type bolt-together) Build time 50-75 hours Standard engine Rotax 582 2-cycle Power 65 hp at 6,500 rpm Power loading 15.4 lbs/hp Cruise speed (75% power) 64 mph Never exceed speed 80 mph Rate of climb at gross 850 feet per minute Takeoff distance at gross 325 feet Landing distance at gross 125 feet Standard Features Rotax 582 engine, ASI, full dual controls with dual rudder pedals and steerable nosewheel, dual throttles, mechanical brakes, in-flight adjustable trim, 4-point seat belts, double-surface presewn wings, 2-blade wood prop, extensive manuals.